Squirrel Bakes: Where have I been?! I feel like I need to completely re-introduce myself I have been gone so long! So what's been keeping me so busy? If you all remember the last Shuttle flight I told you about, well it is finally over and I got my real life back! It was such an amazing experience to be a lead planner for the flight, but I am so glad to move onto the next big project at work...and home. I also made the hubbie some of Julia Child's famous Beef Bourguignon, he love love loved it! After I got my life back from work, the hubby and I went to Europe for a few weeks on vacation! We had an amazing time eating and drinking all over Belgium, Germany, and France. I also talked the hubbie into taking a macaron class with me in Paris, it was one of the best experiences on the entire trip and I cannot wait to share my real french pastry chef tips! Right after I got back from Europe I headed home to St. Louis for a much needed visit with my mom and grandma! While I was gone I missed my blog anniversary :-( We will just have to celebrate later! I also received a few awards from some of my favorite fellow bloggers. 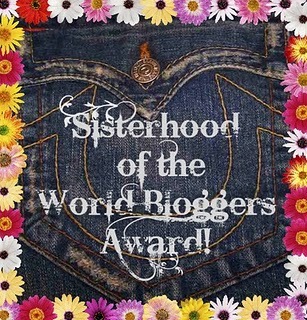 The Stylish Blogger Award from Becky at Baking and Cooking, A Tale of Two Loves who will be holding an online Bake Sale for the American Cancer Society Relay for Life, go check her out! 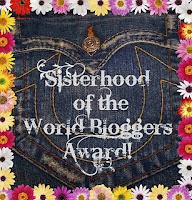 The One Lovely Blog Award and Sisterhood of the World Bloggers Award from Toni at Boulder Locavore, who just posted on how to bake and assemble a real smoking volcano cake, go Toni! Now I am back and in action. Lots of stuff going on at home this week...the Astros home opener AND my hubbie's birthday this weekend! I also have my very first giveaway coming soon, something I cannot wait to share with you! Glad you're back! Looks like ya'll had a fab trip. can't wait for the "real" French tips! Welcome back...you've been missed! We're hoping to go to several Astros games this year...we usually plan our weekend visits home for when they're on a homestand! Welcome back Debbie! I love good news and you bring a lot of them...but the macarons i can't wait!!! Welcome back! Sounds like a great trip, how great that you got a nice trip after working so hard!! Welcome back!! What an adventure it seems like. Wonderful food!! Welcome bake after such great adventures! Glad to have you back! I just got back from St Louis yesterday and I loved it there. My son wants to go back! I am looking forward to future posts! Your trip sounds like heaven. Can't wait to hear more. You brought cupcakes, nothing else necessary. Welcome back! You've had quite an exciting few weeks it seems :) That beef dish you made for your hubby looks fabulous- you wouldn't happen to be willing to share the recipe would you?? Oh and those fluffernutter cupcakes are obviously fabulous looking. bakers, so we need more, for sure! Welcome back. Sounds like you've been busy but had a wonderful time. The trip to Europe, the macaroon class - oh, how I dream of thee. Oh...Those cupcakes look soooooo yummy!!! I LOVE! Sounds like you've been gone with good reason! Can't wait to hear about that macaron class! Welcome back..your cupcakes look divine!!! also Congrats on top 9!!! You have a simple lovely blog, and those cupcaks look to die for! Yum!! Welcome back!! And what a way to come back...these cupcakes are adorable! Congrats on the #1 spot!! I was wondering what had happened to you...glad all is well...looks like you had a fab time while you were away. Will you be posting the recipe for the Fluffernutter Cupcakes? They look amazing. Yum! All the food sounds delicious but it sounds like some of yout experiences were even better. Lucky to take a professional macaron class! Those cupcakes look amazing! I'd love the recipe! This is my first time on your blog and believe me,what an amazing place you have!I absolutely loved your recipes and congrats on making it to the Top 9! I have this event running at my place - so do come in for a peek anytime and link up if you wish! Sounds like a great trip and the cooking class sounds like a blast! Your cupcakes look yummy.... congrats on the top nine! What a sensational month! A macaron class in Paris sounds like a ton of fun! 'The last shuttle flight'??? I feel I 'missed the memo'. Clearly have some catching up to do! Your trip sounds great and I love taking classes when I'm traveling like that. Will be looking for that post soon! Hope you are glad to be back starting to settle in and we'll be reading more of you soon! Sounds like you have been one busy lady. Great stuff. These cupcakes look amazingly delicious. Congrats on the Top 9 today! Welcome back :) Your past few months sound packed with some seriously awesome stuff. Excited for more recaps and new recipes! Yahoo, you're back! I thought there was a possibility of a flight in June. I guess is there's a worry about the government shutting down, that chance disappeared. I hate that it's an end of an era. Welcome back! Now get baking, doggonit. I've missed your stuff.